February 3 marks the epic Super Bowl 53. An epic faceoff of LA Rams vs. the New England Patriots is second only to the timeless battle of green vs. red. Fans on both side will be out cheering their team to victory! 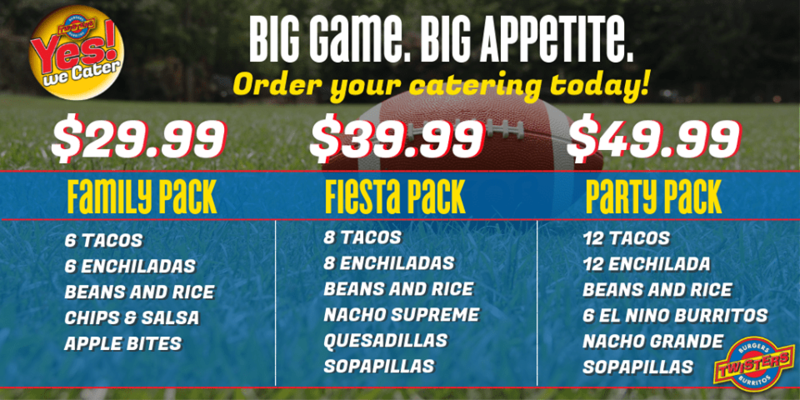 As your family and friends gather around to watch this years game, don’t worry about cooking – let us take care of everything with our winning catering team. We’ll be sure to make your party be the best in super bowl history, so regardless who wins, you’ll be taking home the host trophy! Learn how we can help today, whether your teams is craving burritos, burgers, enchiladas, or nachos – we’ve got you covered!